Have you seen this book? 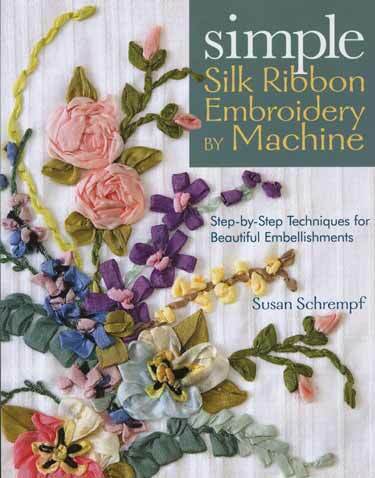 Simple Silk Ribbon Embroidery by Machine by Susan Schrempf is another example of thinking outside the box. Susan Schrempf's instructions are straight forward, and the pictures detail her simple method for embellishing projects using silk ribbon, including clothes, pillows, wall hangings, etc. She uses monofilament and a hoop, although I skipped the latter. With a few practice runs you will have amazing results! The first time I used her ideas was to adorn a table runner I made for my mother-in-law, and the design turned out so beautiful... I have added stems to fabric flowers, and quickly added leaves and flowers to wall hangings that needed more pizzazz. The key word here is 'quickly'. Although I truly enjoy hand work, sometimes I want to embellish my quilt projects using the sewing machine. If you have wanted to do the same but had no idea about what to do, here is the perfect book for you. You will learn the basics of her technique and then be able to apply it to your projects with confidence. Once you go mac...you'll never go back. I used to have a similar problem with my stepson using my laptop. He would download free music and inevitably find every virus available. We upgraded...gave him the "infected" lap top and I bought a mac. They are more expensive, but it hasn't let me down. Good luck!